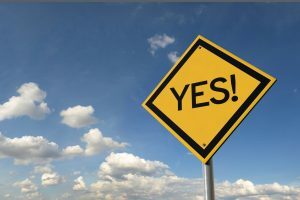 I read a great blog post the other day encouraging readers to say yes to spotlight moments, written by fellow PR professional Catriona Pollard. Catriona and I have known each other for quite a few years. She was actually the catalyst for this blog – Women Who Cycle. Nearly seven years ago I was attending a business lunch where Catriona was the guest speaker. She was talking about blogging, and it sparked an idea in my head that a week later led to the birth of womenwhocycle.com. That’s a bit of an aside, but Cartriona writes a lot about establishing and promoting a personal brand, and saying yes to spotlight moments is just one part of it. Her story focuses on a friend who had the opportunity to teach a yoga class when she’d just finished her training. She could have easily said ‘no’ and had some legitimate reasons for doing so, but she said yes, and took herself well out of her comfort zone. You can read Catriona’s post here. I think women are particularly good at shying away from spotlight moments, and I’m certainly guilty of it. The whole concept has some great lessons for female cyclists. I’ve met many women who are just beginning their journey as a cyclist, and so many of them don’t think they are good enough to say yes to those spotlight moments. Nearly 10 years ago I was also given a chance to say yes or no to a spotlight moment. My partner Phillip asked me to join his corporate team to participate in a charity bike ride called the JDRF Ride for a Cure. For me it represented a huge spotlight and I had very little confidence that I could actually do it. It’s fortunate that Phillip had more faith in my ability and coaxed me on. The last ten years for me would have been so different because riding a road bike has changed my life. Catriona also talks about the first yes letting the genie out of the bottle. It can lead to many yeses that are full of magic and wonder. I definitely subscribe to that theory. The first yes I said, to agree to do the ride, led to so many other yeses that have been completely full of magic and wonder. Share your experiences of idea – say yes to spotlight moments via comments or the Women Who Cycle Facebook page.